Central Hudson Gas & Electric wants to test the market for complex microgrids in a project with NRG Energy that may span as many as 50 buildings. The New York utility described the project in a recent filing before the state Public Service Commission. It is one of the seven projects offered by Central Hudson to help the state develop its Reforming the Energy Vision (REV), a new market model that elevates the use of distributed energy. Central Hudson, a Fortis subsidiary, first floated the microgrid idea almost a year ago, as part of a rate request before the commission. Now it is revealing more details about the project. Like other REV projects, its goal is to develop markets not before used for microgrids and other distributed energy resources. In this case, Central Hudson and NRG Energy want to test demand for multi-customer grid-tied microgrids; specifically a customer’s willingness to pay for a complex microgrid’s premium services. The project also will show how microgrids can create revenue for utilities and partners. If it succeeds, the project will identify “value streams that can be quantified and captured by the parties, and commercial structures, terms, and standards that may be replicated,” according to the filing. Customers who sign onto the microgrid will share in its costs. This means the costs will not be socialized within rates charged to all utility customers, as is typically the case for utility infrastructure. Instead, the microgrid will be paid for by only those who use it. The microgrid will be customized to meet customer needs. Likewise pricing and rate design will be tailored based on services offered. For example, a customer might contract for time-of-use pricing, critical peak pricing, or fixed prices. “Those investments will be evaluated by the customers according to their standard business protocols, and therefore must provide value in order for the customer to move forward,” the utility said. In return for payment, microgrid customers receive services a cut above what they would get from grid power — better efficiency, reliability and resiliency. Customers also will have the opportunity to monetize their investment by using the microgrid to participate in demand response and other grid services. 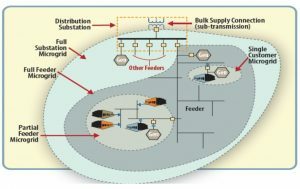 Since the economics of complex microgrids are still being sorted out, the utility said the project could go a couple of ways. It may create a pathway to drive down microgrid costs, so more customers can afford them. Or it may show that microgrid costs are still high and require utility rate-based cost recovery or subsidies — at least until distributed generation costs drop more. Central Hudson and NRG Energy hope to build a design that can be used for similar projects in New York and elsewhere. So they plan to use standard equipment and modular controls. This will be a challenge since microgrids tend to be customized to meet customer’s specific energy needs. The project will include various types of generation, including renewables, as well as energy storage, combined heat and power, and other elements typical of microgrids. It will test microgrid participation in the wholesale marketplace, including grid power imports/exports, reserve management, voltage control, and frequency regulation. The utility envisions both private companies and public institutions signing on to the project. Central Hudson has applied to the NY Prize to cover feasibility study costs for the project. The utility also has proposed several other REV demonstration projects, which use community solar, community aggregations, demand response and behind-the-meter services. The filing asks the commission staff to review and authorize the microgrid and other projects. Track New York REV microgrid projects. 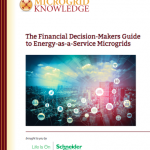 Sign up for the free Microgrid Knowledge newsletter. Can a Utility Code of Conduct Keep Competition Fair in a ‘REV’ World?